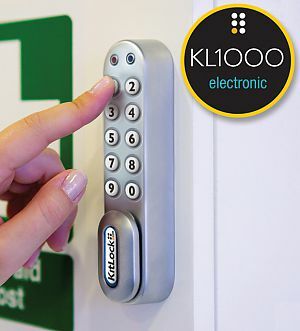 The KitLock 1000 locker locks are a compact digital lock ideal for replacing keyed cam locks commonly used on a wide range of lockers, cabinets and cupboards. 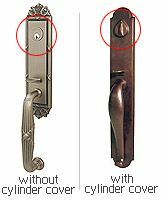 The keyless locks are easy to retrofit, taking just a few minutes to remove the existing cam lock and then making an additional top fixing for the new lock. 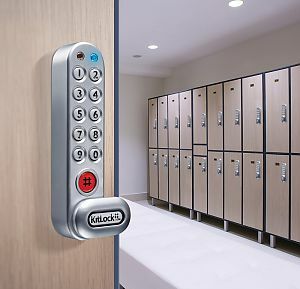 Can also be fitted to a locker or cabinet that does not have an existing locking device already installed, giving the user immediate, simple, keypad access without the hassle of keys! Door Thickness: Lock packed assembled for doors 3/4”(19mm) thick. Includes parts to accommodate 1/4" (6.35mm) to 1" (25mm) thick doors. 11 individual round buttons, dual epoxy coated. 15,000 openings from 2 x AAA cells (supplied). Ideal for home or office in cabinets, lockers, cupboards, medical carts, etc. IP54 rated when used with the rubber door gasket (sold separately). 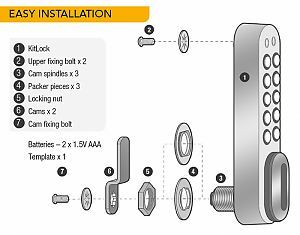 Supplied as standard with two cams, all the necessary fixings, template and operating instructions to fit the lock to the cabinet, locker or cupboard. Private Use - This is the most common function and used where the same code will be repeatedly used, e.g. a pupil in a school or an employee with the same locker in the workplace. 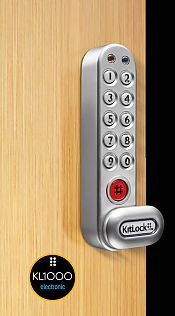 Public Use - In this function the KitLock operates with a single User Code. The user enters their own personal four-digit code. This locks the lock. The same code is entered once only to open the lock before being erased and ready for the next new user. This function is used for short term, multi occupancy applications, e.g. a locker rooms or spas. 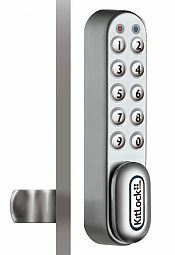 View more from Codelocks, Inc.
Locks shipped with factory default code and in private use function standard. ALL can be programmed to public use and unique management codes. Custom programming available by special order, call for info and pricing. 4 code levels available: 8 digit Master Code; 8 digit Sub-Master Code; 4 digit User Code; 6 digit Technician Code.